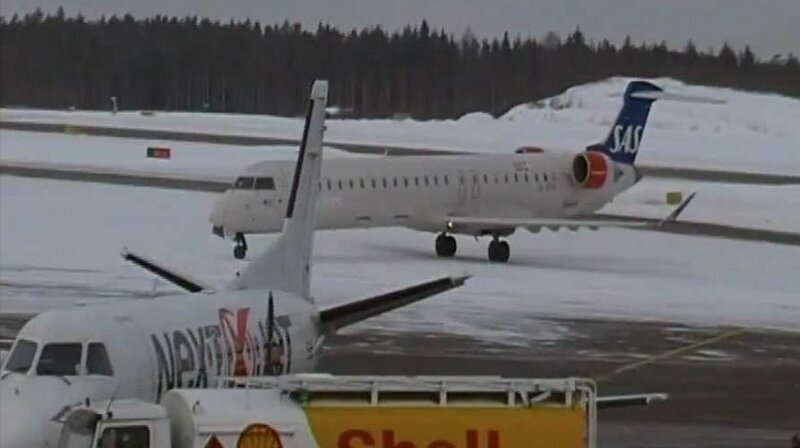 Cityjet Canadair CRJ-900, on behalf of SAS Scandinavian Airlines, performing flight from Stockholm to Turku landed on Turku’s snow covered runway, but skidded and spun counterclockwise around by 180 degrees before coming to a stop on the runway near the end of the runway. The crew declared emergency, emergency services responded and checked the aircraft. The aircraft held position for about 7 minutes, then taxied to the apron on own power. There were no injuries, the aircraft sustained no damage. The runway was closed for about 90 minutes for an inspection to ensure no damage to the runway, runway lights or other infrastructure had occurred. The return flight was cancelled. The occurrence aircraft is still on the ground in Turku about 8 hours after landing. Passengers reported the aircraft touched down hard and bounced several times until reaching the end of the runway and spinning around. Emergency services reported the aircraft skidded sideways for some time before coming to a stop. The landscape and runway were completely covered in snow, weather most likely played a role in the occurrence that could have resulted in a more serious accident. Following inspection by emergency services the aircraft was able to taxi to the terminal on own power, the aircraft had not sustained any damage but needs to be examined. Finland’s accident investigation board have opened an investigation into the occurrence.